According to the American Heart Association, walking has the lowest dropout rate of any physical activity. Think it doesn’t do any good? Think again. Walking is low impact, so it’s easier on the joints than running. It is safe—with a doctor’s okay—for people with orthopedic ailments, heart conditions, and those who are more than 20% overweight. In addition, research has shown that you could gain two hours of life for each hour of regular exercise! That quick stroll around the block seems a little more worthwhile now, doesn’t it? The Napa Valley Vine Trail Coalition is proud to partner with Ole Health to bring Walk with a Doc to Napa County. Walk with a Doc is a walking program for everyone interested in taking steps for a healthier lifestyle. What better way to start your weekend than on your feet making strides to help your heart and improve your general health to live longer! While you walk at your own pace, you’ll have the opportunity to have questions answered by local physicians. Napa County has the highest rates of obesity and diabetes in the Bay Area. But studies show even moderate increases in physical activity reduce stress and lower the risk of many serious health issues. Napa County is also, sadly, in California’s top ten counties for bicycle accidents involving motorists—and things are getting worse. 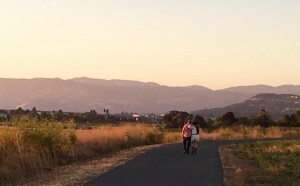 Separated trails like the Vine Trail are, by far, the safest places to walk, run, or bike. More than 70% of Americans would bike and/or walk more if they felt safe. A safe, free, easy-access biking and walking trail system can significantly improve community health. 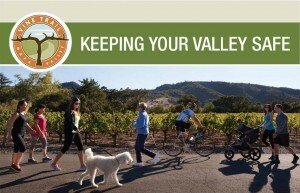 The Napa Valley Vine Trail will provide this safe trail, for people of all ages to enjoy our valley. Its human scale, continuity, and vast outdoor exhibition space will unify the diverse landscapes and varied communities of this much-visited area. Building on Napa Valley’s rich sense of place, the Vine Trail’s public art and discovery programs will help transform the path into a true cultural corridor—and an inspirational “only in Napa Valley” landmark for residents and visitors alike. 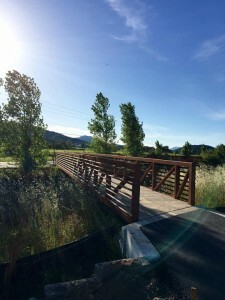 Parts of the Vine Trail are currently open to the public, while other parts are under construction and/or still in the planning and development stage. Please visit our website for more informatio n about the Vine Trail. 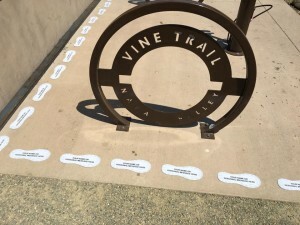 The Napa Valley Vine Trail Coalition is a grass-roots nonprofit with a vision to build a walking and biking trail system to connect the entire Napa Valley—physically, artistically, and culturally. 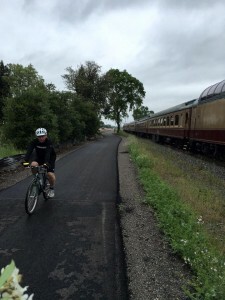 We are working to design, fund, construct, and maintain 47 safe and scenic miles of level, paved, family-friendly, pet-friendly, free-access Class I trail, stretching from Vallejo’s Ferry to Calistoga. Walk with a Doc was started in Columbus, Ohio in April 2005 by Dr. David Sabgir and has now expanded throughout the country. You don’t need any special gear and there are no special rules. Just put on a pair of comfortable shoes and walk. Visit us on Facebook or call 707-252-3547 for more information!